Have a moist site in your landscape? 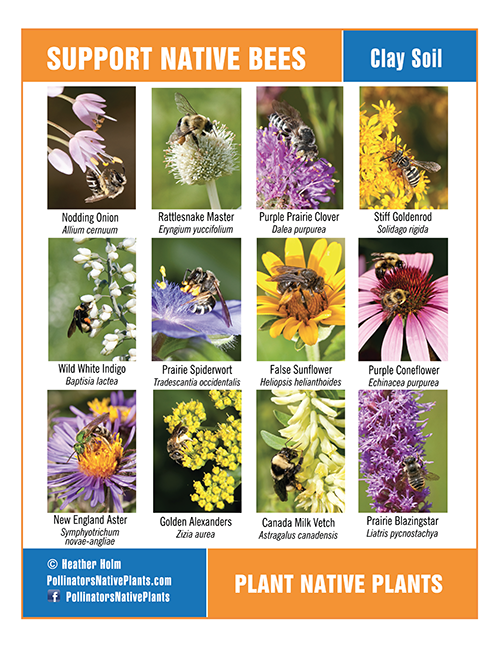 Here are a few commonly sold native perennials for moist sites. This is an extremely showy native Lily. 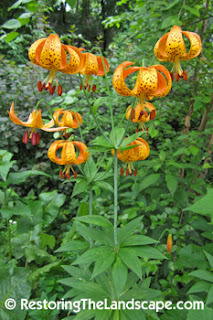 Bright orange flowers open in early July. The nodding flowers have 6 spotted tepals that curve upwards. Michigan Lilies are tall, reaching heights up to 6 feet. The pointed leaves are arranged in whorls on the gray-blue colored stems. 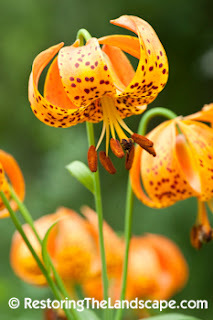 Michigan Lilies like moist, well drained soils. Their habitat includes sunny locations at the edges of wetlands as well as near small streams to large rivers. 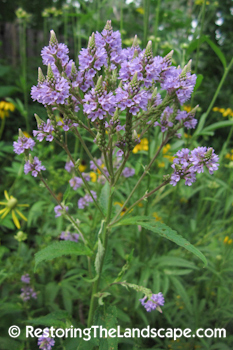 Blue Vervain is a native bee favorite in our landscape. The light purple, candelabra-like blooms open in early July. Each individual flower spike is composed of tiny 5 parted flowers that open from the bottom upwards. This native is also tall, reaching heights up to 3.5 feet. A common plant at the edges of lakes and wetlands, it prefers a full sun location in moist soils. White Turtlehead is the one of the few larval host plants for the Baltimore Checkerspot Butterfly. Its bright white closed flowers resemble the head of a turtle, giving it its common name. Flowers open in August, and are clustered at the top of the oppositely arranged, long narrow dark green leaves. 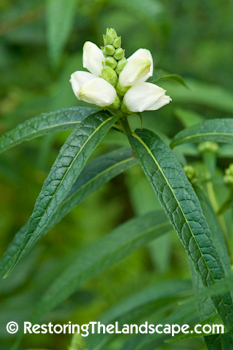 White Turtlehead can be found along streams, and in wet woods in partial shade. 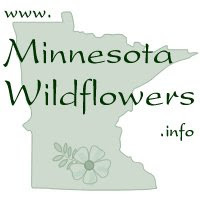 White Turtlehead is between 2 and 3 feet tall. 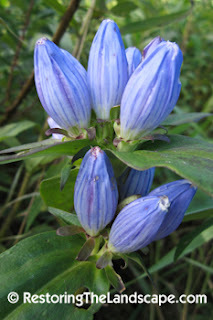 Bottle Gentians flower in late summer, near the end of August into September. The upright, closed petals look bladder-like in appearance. 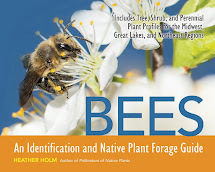 Flowers are pollinated by bumble bees who force their way down the flower through the tiny opening. Bottle Gentian grows in moist areas near wetlands. It can grow as high as 3 feet, flowering above adjoining grasses and sedges. Planted in masses, it can be very showy. It also works well to interplant this native with a spring flowering companion.